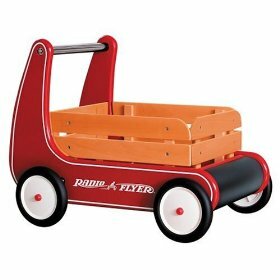 The Radio Flyer Classic Walker Wagon is an excellent product. We bought it for our son’s first birthday and he LOVES it. He plays with it every day. He is not yet walking on his own, but he enjoys walking around with this wagon. His favorite thing to do is to climb in and out of it and there is no greater happiness than sitting in the wagon and being pushed from one side of the room to the other. Unlike many push toys out there, this one does not tip when my son leans on it. The wheels have a “push-back” mechanism, which prevents them from moving too fast, even on bare wood floors (we don’t have carpeting). The wheels are rubberized and roll quetly, except for the clicking of the “push-back” pegs (which can be removed). There is plastic rounded bumper on the front, so if the child walks into furniture or walls, it leaves no scratches. The wagon provides an opportunity to practice climbing in and out (which involves some problem solving on my son’s part). It can also be filled with his favorite toys (in our case I fill and he empties). This is a fantastic first walker/toy, definitely worth the price.